A year later, many of the business and political elites remain dismissive of him, privately rolling eyes and using words like “madman,” but there was excitement about economic growth, and the tax cuts and regulatory rollback he has ushered in. The real test of how the two sides will deal with each other will come Friday when Mr. Trump addresses the World Economic Forum. 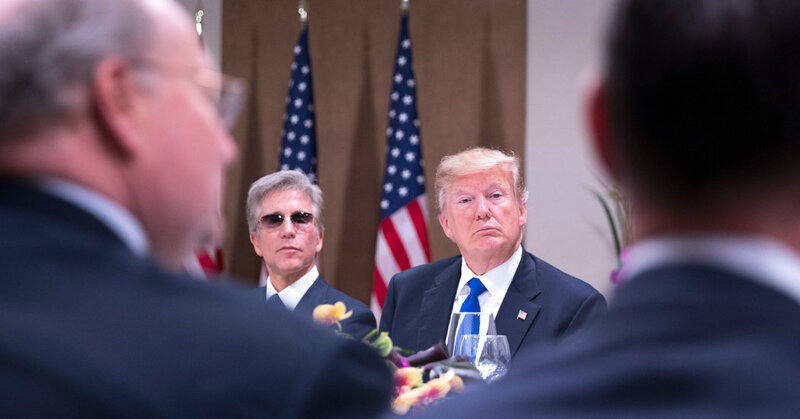 Mr. Trump’s plan is not to stick his thumb in anyone’s eye, aides said, but to soberly promote his view that trade should be fair and reciprocal while selling his story of economic energy and soliciting foreign investment. Whether he will follow the script, they acknowledged, was anyone’s guess. Davos has never encountered anyone quite like Mr. Trump. For one week each year, this ski town is transformed into a festival of deal-making capitalism, international wonkery, late-night parties and earnest save-the-world panel discussions. Heads of state, corporate chieftains, policymakers and celebrities slip and slide along icy streets to stop in glass-enclosed, tech-heavy spaces set up by countries like India and South Africa and companies like Facebook and Google along the Promenade, the main drag. At times, the tensions of the outside world follow them here. The Ukrainians were chagrined to discover this year that the space they rented at Promenade 73 turned out to be right across the street from Russia House at Promenade 72. Grim jokes ensued about the Russians crossing the road to take over a room in Ukraine House. Unlike other visitors, Mr. Trump did not wander the pavilions. He attended a reception in his honor by the forum, and then was host at a dinner for about 15 chief executives from firms like Siemens, Nokia, Nestle, HSBC, Anheuser-Busch and Bayer. As the executives tucked into grilled beef tenderloin or fried Swiss pikeperch with purple carrot purée, Mr. Trump flattered them as “some of the greatest business leaders in the world” and invited them to talk about their businesses, much as he does at cabinet meetings back home. Like his cabinet secretaries, many of the guests volunteered praise of the president and gratitude for his efforts to cut taxes and regulation. The greeting did not surprise everyone. “Trump made a Christmas gift to everyone with those tax rebates,” said Charles-Edouard Bouée, chief executive of Roland Berger, a global consultancy with offices in Shanghai and Munich. Mr. Trump arriving in Davos. “The real message is we want great prosperity and we want great peace,” he said. Even leaders with grievances against the Trump administration seemed intent on playing up to him. An aide to Mr. Trump who arrived before him expressed astonishment that he was being received so warmly by people he had criticized so harshly. But outside the president’s earshot, there was still plenty of skepticism and concern. At a separate dinner on Thursday night, George Soros, the liberal financial trader and philanthropist, called Mr. Trump the vanguard of a new wave of authoritarian rulers that threatens open society. In the days before Mr. Trump’s arrival, the leaders of India, Canada, France and Germany used a series of high-profile speeches to mount an aggressive defense of the global trading system, while other officials worried that Mr. Trump and other nationalists posed grave risks. Unlike Bill Clinton, the only other sitting president to attend Davos, Mr. Trump has threatened to scrap the North American Free Trade Agreement with Mexico and Canada and a separate pact with South Korea in addition to the Trans-Pacific Partnership, or TPP, that he withdrew from shortly after taking office. Before leaving Washington this week, he slapped new tariffs on imported solar panels and washing machines. But as he has on immigration in recent days, Mr. Trump toggled between being hard-line and accommodating. In an interview with CNBC to be aired on Friday before his speech, Mr. Trump raised the possibility of rejoining the Pacific partnership, which was negotiated by President Barack Obama but never submitted to Congress amid bipartisan opposition. For other Davos participants, more disturbing than his trade views were his utterances on race and gender, most recently in his resistance to immigrants from Haiti and Africa. Lynette Wallworth, a virtual reality filmmaker from Australia who has traveled the world to introduce viewers to diverse cultures, expressed hope that Mr. Trump would use his time here to absorb challenging points of view. Tolu Oni, a professor at the University of Cape Town in South Africa, asked if Mr. Trump was capable of absorbing opinions that conflict with his preconceptions.